Green light to RFID track Oregon’s school children? 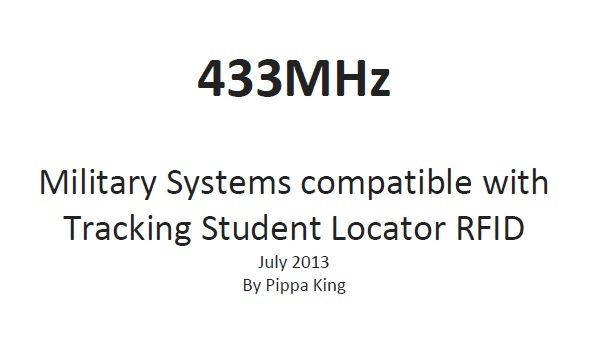 The original January 2013 wording goes on to say that a school may use RFID to track property, such as instruction manuals and electric items, but if a student takes possession of said property the school must inform the student that the property, therefore the student, is being tracked. This rewriting of HB2386 seems to go on to say that a Oregon school district cannot require a student to wear RFID for tracking unless the Oregon State Board adopts standard rules about the use of RFID with children, as decided upon as in the above statement. This appears to read that if a school wants to impose RFID tracking on students the State Board has to agree to it under (their own) standards/rules. Informing a student of the fact they may be carrying a RFID tracked object has also been dropped from the wording of the original text. …yet point 2 (c) states that the bill would allow for “…a student or a parent of a student to choose not to have the student wear, carry or use an item with a radio frequency identification device.” (?) Can a student not consent when a school has required it to carry RFID tracking, backed by the State Board? Is this another court case waiting to happen? The bill takes effect as of July 2013. The history of the bill going through the Oregon Senate is here. Currently Oregon does not use RFID to track students in any of it’s schools, so maybe a little strange they have spent senate time on this bill. But with other schools in the US introducing RFID for financial (funding according to attendance) and “safety” reasons, perhaps this comes as no surprise in that Oregon does not want a situation similar to the adverse publicity the Hernandez case in Texas brought to school boards RFID tracking students – better to set the ground rules first. With over 850,000 children in Oregon, with 550,000 K-12 students, there is a fairly healthy market for RFID systems with perhaps this bill giving a green light to the RFID industry that these schools are good to go. How sad that HB2386 has been changed with the potential to destroy children’s rights and civil liberties, when there was a great chance to preserve the next generation’s freedoms and our societies integrity in respecting our children’s privacy. A school district in Northern California is to start tracking children on and off schools buses via RFID and GPS technology. The system is free to the district, taxpayers and parents with local businesses sponsoring the messages sent to parents phones to tell them their child is safe at school. The company East Coast Diversified Corporation (ECDC), the parent group of StudentConnect, is enabling this RFID tracking technology to be financed using adverts sponsored by local businesses. This just sounds bizarre. What shop would want to sponsor tracking a child? Eroding that child’s privacy. Are society’s ethics and morals to be discarded for “corporate responsibility” – trading safety messages about location tracking of our children in exchange to be advertised at? Do we not trust the bus driver, schools and society to show a collective care for our youngest? Yes, there are random acts of violence that defy logic or reason but when statistics are scrutinized both from the industry selling this technology and real risks that do exist, possible perceived scenarios – that involve compromising children rights more than they do protecting their safety – arise offering a financial solution to a situation that is not that urgent and disproportionate to the reported transport crisis. There is money to be made in tracking children, that is for sure. We should have more faith in society to care for our children collectively. All members of society, community, family, corporate, faith based, all aspects should care for all. We should not rely on a money driven system to take responsibility for our children, nor be led into believing that that is where responsibility lies. Surely as a society, whatever country or community you live in, we should all take a part in looking out for each other and not be driven in this supposed care for our children from a financial incentive.